A flight to London was supposed to leave Los Angeles Wednesday night. The flight left Friday afternoon, forcing many passengers to take shelter for days at LAX. Hundreds of passengers on a Norwegian Air Shuttle flight were forced to sleep in the baggage claim area of LAX both Wednesday and Thursday night as they waited to board a flight that was delayed multiple times and did not takeoff until Friday afternoon. Passengers tweeted their frustration and one named Kim called NBC4 to describe what had disgruntled her and many others awaiting the Los Angeles to London flight. “I feel really terrible. I haven’t been able to shower or do anything,” passenger Susan Short of Bristol, England said. Flight DY7096 was originally scheduled to take off on Wednesday night, but after four hours of sitting on the tarmac trying to fix a technical issue, the nearly 300 passengers were told to get off the plane, Short said. Passengers were told that they could book their own hotels if they wanted to and they would be reimbursed. 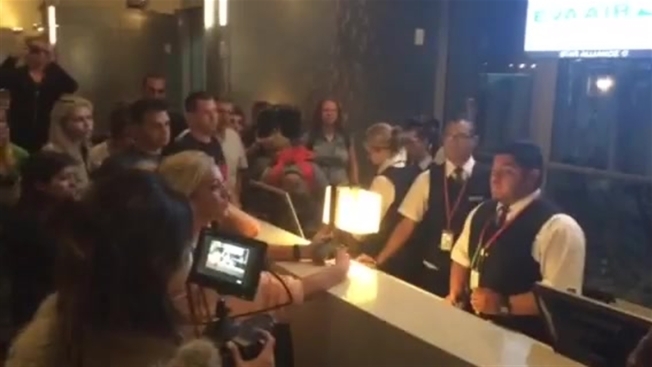 A few people found a nearby hotel, but most hotels near LAX were full. Those with family and friends in Southern California returned home, while many others didn’t know where to begin. “Of course we didn’t know what to do. Our phones were dead, we didn’t know where to go, we didn’t know any hotels so we had to spent the night here (at LAX),” Short said. For Adriana Garcia, 28, of Bell, the delay was putting a damper on her vacation plans before they had even begun. It was her first time flying with Norwegian. "This is a total learning experience," Garcia said. "They need to improve their professionalism, they need to improve their communication." Garcia said she and her high school friends have been planning this trip -- a Disney cruise starting in Barcelona -- for more than a year. The group of friends had hoped to arrive in London, then fly into Barcelona a few days early and shake off the jet lag. Now Garcia said she just wants to get to the port before the cruise sets sail Saturday afternoon, UTC. “Now we’re just going to be jumping into the time change," Garcia said. The canceled flight was rescheduled for 8 p.m. Thursday night, but was then delayed an hour, Short said. That flight was later canceled due to a computer-related issue, Short said. Angry passengers were captured on video shouting their concerns at airline employeees Thursday night. "Tensions were running high" and "police were called to the gate" that night, according to passenger Cal Strode. "At one point other passengers were being more helpful than official (Norwegian Air) staff," Strode said. Passengers told NBC4 they had to wait an hour to two hours for the bags from baggage claim before they could return to their makeshift beds on the airport floor. Garcia didn't recieve her bags from the airline, and instead slept around her friends to keep her warm, she said. Webber claimed Friday morning that “nobody” from LAX or Norwegian Air was telling him or the other passengers “anything”. “All we’re getting is texts from the company and flashes on the poster board, but we don’t believe that anyway,” said Webber. The flight was then rescheduled to leave 9 a.m. Friday, but was then delayed until 12:30 p.m "due to technical problems and crewrest," Norwegian Air Shuttle tweeted. At 9:30 a.m. Friday, passengers reported that no one appeared to be working the check-in area. Norwegian Air Shuttle started flying between the United States and Europe on July 3. The self-proclaimed low-cost carrier has been having problems since the initial launch. “It was cheaper, but I don’t think I’d bother again,” Short said. Many travelers had been tweeting to the airline to voice their complaints. Norwegian Air had been responding to passenger tweets, as was seen on their Twitter page. The flight, scheduled for 12:30 p.m. Friday, landed in London at 8:05 a.m. local time Saturday, about an hour after its expected arrival. "I feel relieved to finally be home in London with a place to sleep other than LAX baggage claim," Strode said. Strode also said that upon arrival in London, there was no one from Norwegian Air waiting at the gate as was promised to them. "Norwegian Air lost all credibility amongst passengers after issuing at least 11 different departure times over a three-day period," Strode said. "I didn't believe we were leaving until we were actually in the air, at which point all of the passengers started cheering and applauding." NBC4 reached out to Norwegian Air for comment, but had not heard back at the time of publication. Oleevia Woo contributed to this report.